There is a very high interest in the launching conference, and there are no more spots. The conference will be live-streamed at https://is.gd/ewpconference12 and https://is.gd/ewpconference13. 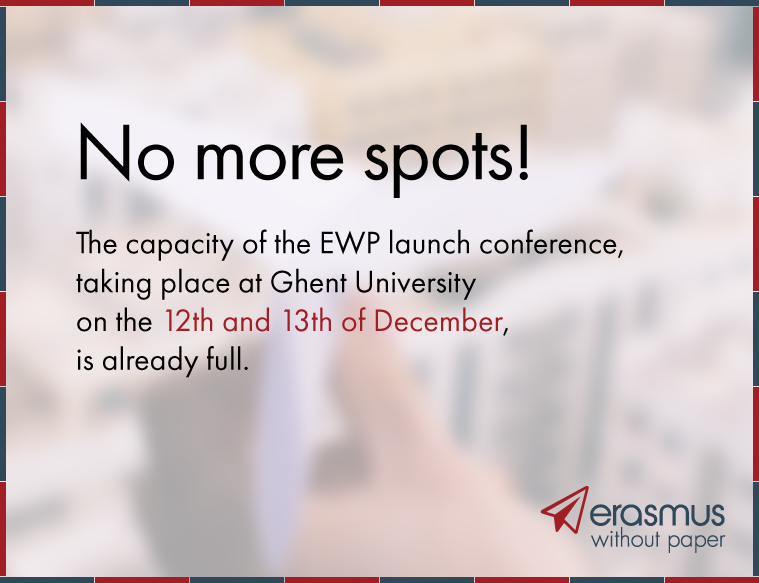 EWP is a flagship Erasmus+ project about creating a European electronic network for student data exchange among Higher Education Institutions, in a first instance for student data connected with Erasmus+ credit mobility, but ultimately for far more than that. The project has attracted enormous interest and the launch of the network will amount to a big step forward for student mobility in Europe, creating the kind of digital public infrastructure that is meant to pave the way for more efficient administrative processes and a better service to students. During the launch we will deal with the EWP network, its use, its relationship to the Digital Revolution in Higher education and its future role in Europe and beyond. We will be able to show it working in an operational way. The event marks the start of operation for those who have implemented it partly or fully, but more functionality will be added and implemented throughout 2019. The implementation of EWP allows for a lot of flexibility. The target group of the event are International Relations Officers, university policy makers, IT management, National Agencies and Ministries, commercial and national consortium SIS providers and other direct and indirect stakeholders in student data exchange. The main event and the formal launch will take place on 12 December 2018 with more detailed and hands-on workshops on 13 December. Registration is open in the form below. You can register for either the two days or just 12 December. For those who come 2 days it may be possible to apply for Erasmus funding (more information here). Once we have confirmed your attendance, see hotel suggestions and how to get to the venue. The final version of the agenda is available here.